Add our comfortable, child-size chair to any room to create a little nook, just for them. Our gorgeous blue star print seat looks beautiful in their nursery, playroom, bedroom or living room, featuring sturdy back and arm rests this is a stylish spot for little ones to read, snuggle and play. 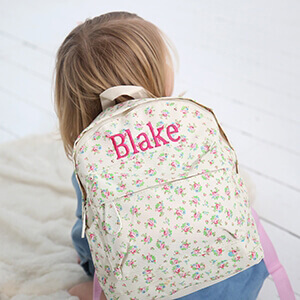 Make it just for them by adding your little one’s name and we’ll embroider it onto the back rest for no added cost – simple! Cover is 100% cotton canvas. To clean, remove insert and wash cover in cold water by itself. Warm iron, as needed.